The Winter Rose is the book everyone is buzzing about. I've seen it on several blogs and it even got itself a spot on Estella's Revenge this month. Donnelly's publishers should work for Stephane Dion; they run an aggressive campaign. I'm not complaining though. I wasn't saying no when they offered it to me to review. In The Winter Rose, India Selwyn-Jones is passionate about one thing: medicine. India turned her back on her wealthy, upper class upbringing to delve into the misery of East End London at the turn of the 20th century. Just out of medical school, she is unprepared for the challenges she faces being a woman in a man's field. Her interests lie in helping women and children but finds little help from her male employer. Her dream of a free clinic seems impossible until help comes in the form of her cousin Wish, Ella the nurse, and her most unlikely ally, Sid Malone. At first, India only sees Sid as cause of all the problems in the East End. He's a gangster, dealing in drugs and prostitution. As she spends more time with him, she finds out that there is more to Sid than what the newspapers say. He's a gangster with a heart of gold. Of course, they fall for one another. Ah, but there are obstacles to overcome, namely Freddie Lytton, India's fiance and a moustache twirling villain. He'll do anything to advance his political career...anything. 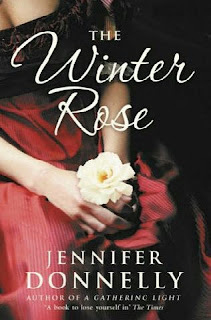 The Winter Rose is the second in the Rose series by Jennifer Donnelly. I didn't read the first book, The Tea Rose but I don't think it's necessary. Donnelly weaves bits of The Tea Rose into the book without interfering with the plot. This book is huge, 700+ pages, but it didn't take me long to read it. It clips along at a good pace. In fact, I had to put it down a few times because I just couldn't take another bad thing happening. (But then I picked it up a half hour later, hehe). Like some other readers, the parts in Africa bothered me. All these people met up in the same place? Africa's a fairly big continent. However, I can see Donnelly's dilemma. How do you get them all together again? I also missed Ella and the Moskowitz clan in the second half of the book. Mama Moskowitz cracked me up. This is a great book for readers who enjoy a big, romantic epic. I look forward to the next in the series. I have this ARC waiting for me and I was a bit put off by the size of it but glad to hear it goes by pretty quickly. I enjoyed your review a lot so looking forward to the book. I do read a Romance once in a while. It looks good. BTW, you have been tagged for book meme page 123. I did read The Tea Rose and I remember feeling irritated by it after about 3/4 of the book. I cannot remember what bothered me - the writing or the story? Anyway, the premise of this one does sound good to me. I started to read The Tea Rose with one of my on-line book clubs quite awile ago and couldn't get into it. I don't usually go for this kind of book. I've heard a lot about this too. I liked her YA novel, A Northern Light and have been thinking about picking up her adult fiction. Darn it! Gautami beat me to it! I tagged you for the 123 meme as well! Oh, and I loved this book! Can not wait for the next one! Tara & Teddy- Hopefully you'll like this one better. Gautami & Marg- Thanks. I'll do this soon. Charity- Give it a try!